Use the employee termination checklist to assist with this matter. Download the checklist today to track employee termination records. When an employee is terminated, it’s important to make sure the company has retained all of its properties – physical and intellectual. This employee termination checklist template is used by hundreds of employers to ensure they have all the information and property due upon termination of employment. 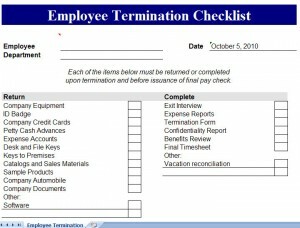 This termination checklist template is available for free instant download on this page! This employee termination checklist template will help employers ensure all company equipment is accounted for, such as ID badges, company credit cards and all keys and access cards. The termination checklist template also includes custom fields and a column for completed tasks, such as an exit interview, confidentiality report and benefits review. If you find this termination checklist template useful, please share this page on Facebook, Twitter or Google Plus. Click the link to download this template: termination checklist. When an employee or employer terminates a worker, there are administrative issues that need to be resolved so the separation happens on good terms whenever possible. Use this employee termination checklist template to keep everyone and everything accounted for to keep the break clean.